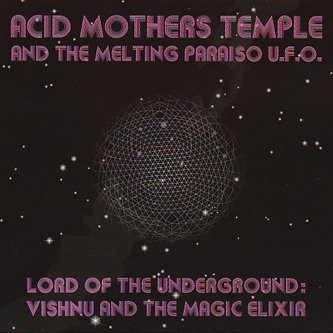 Continuing on their winning streak, Acid Mothers Temple bringing their J-psych alchemy to Alien8, dispensing three new pieces. 'Eleking The Clay' begins with some church-like organ figures, ushering in a bit of a Keith Emerson vibe before the guitars kick into an echoing drone-raga, venturing into some outlandishly protracted fuzzed up riffing hinging on Eastern harmonies. Offering a brief interlude, 'Sorcerer's Stone Of The Magi' arrives with a hushed, folksy and acoustic feel, washing your ears out in time for the epic 'Vishnu And The Magic Elixir' a sludgy, meandering twenty-five minutes that holds off the overdrive pedals for a good twelve minutes or so, spending time delving into deep, dark sixties weirdness laden with sitars and cavernous acoustics. When the band do hit their stride you get the obligatory fuzz solo payoff with plenty of far-out blues licks and all those trademark AMT oscillator sweeps.